I’ve recently had the opportunity to travel to our nation’s capital a couple of times through our relationships with trade associations (The App Association [ACT], an international software advocacy and educational organization) and partners such as athenahealth. These are always whirlwind days, packed with meetings with Congressional staffers, members of the Office of the National Coordinator (ONC) and regulators from the FDA, FCC and others. While it restores my faith in our democracy that we as individuals – and as representatives of smart software companies – can gain access to our elected representatives and regulators, one can also see up-close the polarization and partisanship that often drive decisions and slow the work of the people. One must always be cognizant of which side of the Hill one is on, which party holds the majority there, and what their preconceptions might be. Those opinions can be pretty predictable at times, but most of the people we meet with are earnestly willing to listen, and ultimately, the important thing is that the topics that affect U.S. healthcare are being discussed. Technology can be a fix – if it’s innovative and integrative: Regardless of political affiliation, everyone believes that technology will be a major force in “fixing” our healthcare system. New technologies are quickly recognized and appreciated in D.C. for their “cool factor” and sophistication. And, while the market is becoming saturated with individual self-help and wellness apps, there’s an appreciation that apps directed at clinicians are also key. There’s also a growing appreciation that a continuing lack of interoperability between systems is a huge impediment to well-integrated care and a financial drain on the system. I expect the once-esoteric discussion of interoperability to be front and center from here on out. Clinical decision support (CDS) needs to be carefully defined: The FDA’s regulation of software as a medical device is praised by some as guarding the populace from dangerous practices and reviled by others as overstepping its mandate. The issue of whether and how to regulate CDS software is gaining attention as one of the big EMR vendors (who I shall not name here) is lobbying to leave it unregulated. The definition of CDS is a tricky one, though. Taken broadly, CDS might include a physician reading an article in a peer-reviewed publication such as the New England Journal of Medicine and incorporating its findings into clinical practice; clearly, not an issue, and impossible to regulate. But, CDS software functionality, when delivered in near real-time at the point of care, has the potential to change care decisions on the spot, and needs more scrutiny and control. At least that’s the way I look at it, especially if it’s me or a family member on the table. IP protection is tricky, but necessary: There’s a question on the Hill of whether IP protection helps or hinders innovation. A number of small software companies have been victims of “patent trolls,” who claim to own a particular patent, and send robo-demand emails threatening action. Often, it’s less expensive to pay the extortionate sum suggested than to hire legal counsel to defend against the claim. To counteract this, bills under consideration (but probably stalled until after the mid-term elections) would severely limit the practice and set penalties for those who would abuse patents. At the same time, though, there are legitimate reasons for IP protection. Those of us who use it appropriately shouldn’t get swept up in any fervor that would limit our ability to defend our patents. This is an important balance that needs to be struck. Spectrum access and costs need to be balanced: The FCC is sympathetic to the idea of making wireless spectrum as widely available and inexpensive as possible, for example, to help expand access to telemedicine in rural areas. But, the agency’s mandate is to also realize as much money as possible from spectrum auctions. The goal needs to be finding a balance between reasonable gains for the federal treasury and affordable rates to help drive new care delivery models. 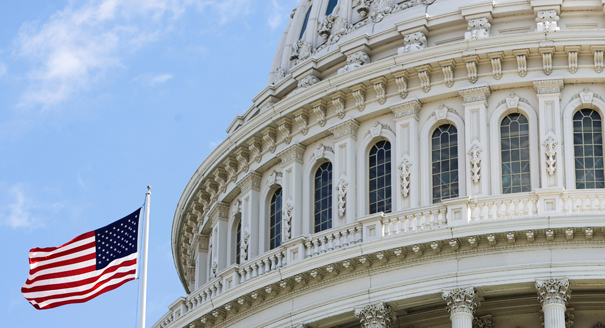 While change is a gradual process in Washington, it is exciting to see that many of the healthcare industry’s concerns are being debated and discussed in the seats of power. We’ll have to wait and see where some of these issues land, but I remain hopeful that with enough input and discussion we’ll get things right. Mike Mitsock is the Chief Marketing Officer at AirStrip. Mitsock has more than 30 years of experience in technology, product management and marketing across a variety of industries and in enterprises large and small. He was most recently Chief Marketing Officer for the Provider Solutions business at Optum, a billion-dollar division of United Health Group. Mitsock was also part of the leadership team of Picis, Inc., a specialty EMR vendor acquired by Ingenix (the predecessor to Optum) in 2010. This entry was posted in Uncategorized and tagged accountable care, AirStrip, capitol, Clinical Decision Support, clinical decision support intelligence, democracy, FCC, FDA, health, healthcare, HIll, information technology, IP protection, mhealth, technology, Washington. Bookmark the permalink.